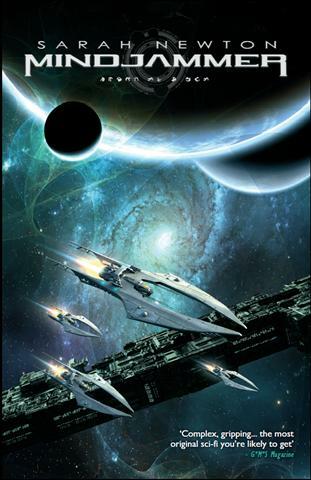 I first encountered Sarah Newton in 2010, when Howard Andrew Jones mentioned how impressed he was with Mindjammer, a far future transhuman space opera setting she wrote for the Starblazer Adventures RPG. I picked up a copy of her massive Legends of Anglerre fantasy roleplaying game on the strength of his rec and wasn’t disappointed. It was a gorgeous and inventive game based on the popular FATE system and we reviewed it in detail in Black Gate 15. I was especially impressed with Sarah’s crisp prose and attention to detail. We don’t let talent like that get away if we can help it, so we recruited Sarah as a BG contributor last year. Her detailed appreciation of a classic urban setting, Pavis – Gateway to Adventure: The Classic RPG City is Back! (parts One and Two) was one of the most popular gaming articles we’ve published on the website this year. IT IS THE SECOND AGE OF SPACE… In the seventeenth millennium, the New Commonality of Humankind is expanding, using newly-discovered faster-than-light travel to rediscover lost worlds colonised in the distant past. It’s a time of turmoil, of clashing cultures, as civilisations shudder and collapse before the might of a benevolent empire ten millennia old. Mindjammer is a very exiting and intelligently-written novel that should be on the reading list of every SF fan! Mindjammer is available now in Kindle format for $3.99 and in print for $15.95, both from Amazon. Check it out.